When Jason Gray, or Jason Gay as he was known back then, first emerged onto the US scene he was often introduced as a thoughtful singer/songwriter who also happened to have a speech impediment. When he signed to Centricity Records in 2006 Jason had a frank discussion with his record company about it. The singer told Christianity Today, "I'd always had this opportunity to talk about the virtues of weakness and brokenness and how God meets us there. It's a great doorway to begin a conversation about weakness. But when I signed with the label, they said, 'Let's be careful to not let this become a gimmick. You don't want to be known as The Stuttering Artist for your whole career.' I thought that was wise. So we try to make use of it but not allow it to define all of my work." In the autumn of last year Kingsway released in the UK Jason's critically acclaimed album 'A Way To See In The Dark'. Cross Rhythms felt an interview was overdue. Jason commenced our grilling by filling us in on his earlier background. He said candidly, "My early life was pretty eventful and stormy. I was born and raised in small town Minnesota. My mom conceived me when she was very young and subsequently married my dad. My earliest memories are of a lot of conflict in our home leading to my parents divorce when I was six years old. I have a speech impediment known as stuttering and it's probable that it was triggered by this event. My mom was also in various bar bands and I grew up on the road around music and travelling when I was a little boy. "In the years that followed, there was an ugly custody battle that included my being 'taken' (kidnapped sounds too strong) from my mom for six months while I lived with my dad. There were confusing confrontations with social workers who were trying to determine which parent I would live with. My parents remarried other people in the meantime, but neither of the marriages were healthy. My mom married a man who we later learned dabbled in the occult, dealt drugs from our basement and had ties with organized crime. But all the while, God was making himself known to me. I didn't attend church, but I somehow always knew God was real and was pursuing me. It would be too formal to call it praying, but I remember always being in a kind of conversation with God on my walks home from school." It was while Jason was in the fourth grade while he was still living with his father that the teenager became a Christian. He recounted, "I was spending a weekend with my mom who was at an all time emotional low. She decided to take me to see a speaker who had come to town to talk about the dangers of drug use. It turns out the man was actually an evangelist and that night my mom surrendered her life to Christ. (Interestingly, I vomited repeatedly in the parking lot afterwards - I wonder at what kind of inner turmoil I was experiencing that I didn't know how to name...) In one night she went from singing in a bar band to singing at revival meetings! "Friends of my mom came to get us in the middle of the night and whisked us away from our home in Minnesota to the mountains of Colorado where we hid out for a month. It was during this time in Colorado that my heart slowly began to surrender to the work that God had been doing all along in my life." Jason's musical interests at this time were very different from his peers. "While my friends were all into Quiet Riot and AC/DC, I was only interested in classical music as a kid, until I fell in love with Simon & Garfunkel and singer/songwriter music that told stories (Gordon Lightfoot, Dan Fogleberg, Billy Joel). Even when I finally discovered pop music it was often lyric-driven (Billy Joel) or in some way - for a pre-teen anyway - avante garde (Duran Duran). The pop music that eventually captured my attention and shaped me was the brilliant lyrics of Paul Simon, the passion and yearning of U2, and the intelligent musical adventurism of Peter Gabriel. Later in Christian music I was drawn to Rich Mullins, Mark Heard, Charlie Peacock and Randy Stonehill. Well, and Amy Grant, too, but mostly because I thought she was beautiful." For Jason there was no playing music in high school bands. "I was so shy! In part, I think, because of my embarrassment over my speech impediment. But though I loved music - it was my primary escape and later my passion - I didn't play an instrument. I didn't start playing guitar until after I graduated, but once I started there was no stopping. I made up for lost time and almost immediately started playing at my church, local coffee shops and anywhere else they let me." At the beginning Jason had little time for CCM. He admitted, "Though at one time in my life I had contempt for 'contemporary Christian music', I have come to be very grateful to be a part of it. For starters, when people come to a Christian concert, they come to listen - there's a willingness to invite the music and the meaning into their hearts that you won't experience in the bar scene. Even the coffee shop scene can often be filled with people who are more in love with their own exalted ideas than they are with fixed ideas that might shape them. For all of its obvious faults, the Church still nurtures an environment where people come to be shaped by ideas bigger than themselves. This can make for a very receptive audience and I'm so grateful to have an audience who, for the most part, is pretty willing to engage the ideas I sing about." Jason continued, "There's still a lot of work to be done in the Church, and sometimes it can be a place where people are tempted to think they've 'arrived' or found the answers and so they cease to be curious or fall into self-righteousness. These are the things I most like trying to address in my music, awakening intellectual and spiritual curiosity as well as encouraging a kind of self-suspicion that undermines self-righteousness. It's a pretty perfect fit for me. I think of one of my favourite Frederick Buechner quotes: 'The place God calls you to is the place where your deep gladness and the world's deep hunger meet.'" In around 2005 the singer/songwriter decided to change his surname from Gay to Gray. "I resisted it for the longest time - not wanting to cave into culture's sexualisation of harmless words on the one hand or the immaturity of people on the other - but the problem of technology is what finally persuaded me. If you google 'Jason Gay' you get a great deal more than you bargained for. Also, spam filters were often filtering out my website and email preventing people from accessing it. Plus I didn't like that having the last name of Gay was always forcing me into conversations over the issue, and sometimes I just had other things I wanted to talk about. So going 'Gray' was the obvious solution. "To give you an idea of my situation, even changing our name to Gray was perceived by many as some kind of statement about sexuality. And it's an issue that few people know how to talk about lovingly - on either side of the issue. It frankly wore me out to always be embroiled in it. I had people who would come to my show thinking I was a gay rights protestor and I had people avoid my shows for the same reason. For many people it muddied the waters. I didn't realise how much of a burden it was until we changed our name to Gray. The moment we did it I was surprised by an overwhelming sense of relief. I'm happy to talk about the issue and often do, but it was weird to have it always hanging over me no matter what I was talking about." Having signed with Centricity in 2006, Jason released the album 'All The Lovely Losers'. He said, "It was my first real attempt at making legitimate pop music with lyrical content that I hoped would be accessible, intelligent, honest and maybe even a little subversive. 'Blessed Be' is still one of my favourites from that record because I feel like it was my first successful attempt at that kind of a pop song. I tend to be wordy, too (as this interview reveals), so the small amount of lyrics to 'Blessed Be' felt like a personal achievement. The song also embodied much of what I most enjoy talking about which is the idea of the virtues of weakness and brokenness, that God doesn't call us in spite of our weakness, but because of it. My stuttering gives me a unique opportunity to talk about this and, hopefully, bring healing to others." In 2009 Jason's next album 'Everything Sad Is Coming Untrue' was released. He observed, "It was a better marriage of both my personal artistic leaning as well as my desire to make legitimate pop music that is widely accessible. 'More Like Falling In Love' was my first big hit and is a song I'm proud of because of how it genuinely works as a pop song, but also conveys both a very accessible and subversive idea. I think this is the hardest kind of song to write! It is both my most loved and hated song, which hits me as kind of appropriate. It's my most downloaded song on iTunes, and it also elicits the most critical emails, letters and blogs in response. It touched a nerve, I guess. I wrote it as a corrective mostly to myself, a reminder that Christianity, as G K Chesterton wrote, should look 'less like a theory and more like a love affair'. I tend to intellectualise my faith, sometimes as a way of protecting my heart. Because when the heart gets involved, it turns your world upside down. When Jason Gray was Jason Gay I attended the concert in Saint Augustine Florida. There was something about this stories in his songs that really reached deep down into my hurt places. I was the mother of an elementary school age daughter, my husband had just walked out on us. I was hopeless and terrified at the beginning of the concert And for some reason I felt hope full and calm when I left the venue that night. I couldn’t feel the monsters breathing on my neck any longer. Dont know why but I have a deep Godly love for this young man. I am 67 years old and have a son who has also had a lot of hurt and pain. I wish you a wonderful Godly love from a woman and all of our lords blessings upon you. Thank you for all the wonderful hours that I had had listening to your music. I am so proud of Jesus when I listen to your songs. And proud of the love that He has put in your heart towards Him. I like the story. I even heard him in a concert on my favorite radio station. Surprisingly, the way I talk is almost like him, because I sometimes have problems forming words and it has been difficult at times. FYI there is a MASH tv episode where one of the characters actually defends a patient who stutters. Wonderful interview. Jason is always thought provoking... stretching our hearts and thoughts beyond our little individual circles. I always have a lot to ponder after reading something with Jason. Nicely written Tony. I think a more responsible, honouring and less self-centered music appreciation ethic might be us acting less as "fans" and more as genuine supporters and encouragers of all who offer us their music. They aren't simply bands, but people... lives, stories, testimonies in the making, and they pour themselves into the offering of what is produced for us to purchase. "Fans" are fickle and run after the new, drop the old and pursue only what reaches out and grabs them immediately. I believe we can do better than that. Listen, really listen to what is being said in both word and music. Understand. Think about it. And stay with them through thick and thin. Kind of like the people of the church... Jesus and the church are for broken people, not for the ones who have no need of a savior or a hospital for the wounded soul. We should not be a social club nor a fan club, but honest support and encouragement for one another. Anyway, I'm too full of words myself. Love the article. Thanks for writing. 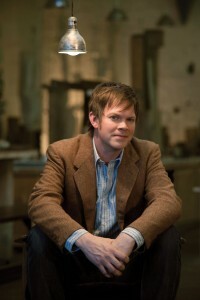 Jason Gray is on the list of Famous People Who Stutter on the website of the Stuttering Foundation (www.stutteringhelp.org). Other people include Bruce Willis, Emily Blunt, Marilyn Monroe, James Earl Jones, Tiger Woods and many more. Check it out!